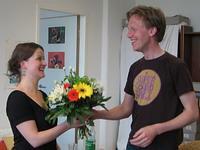 Michael Harms the Director of our German Recruitment office tells us “Kathrin is 29 years old and from Berlin. She will be joining a Care & Community project in India for three months starting in September 2007. Why India I asked Kathrin? She says "I read a lot about India, saw many films, and now I want to see how it looks like by myself. And as it is my first trip to somewhere out of Europe, I did not want to go with out an organization."